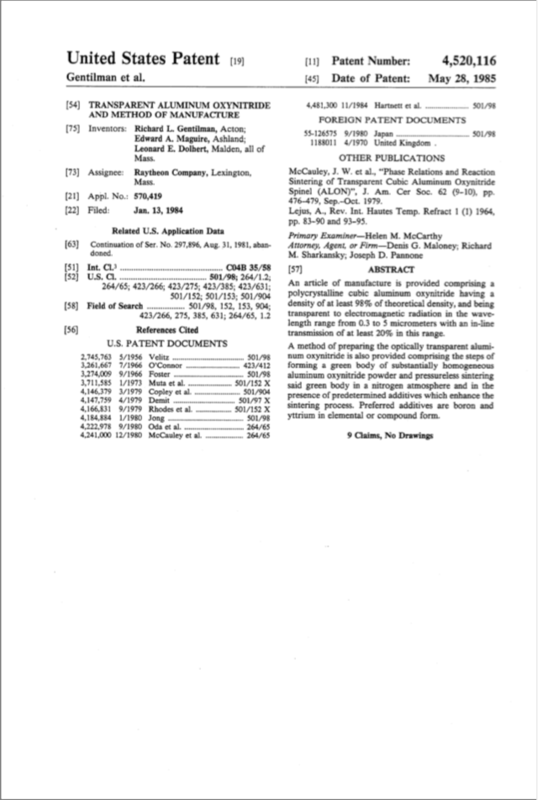 An article of manufacture is provided comprising a polycrystalline cubic aluminum oxynitride having a density of at least 98% of theoretical density, and being transparent to electromagnetic radiation in the wavelength range from 0.3 to 5 micrometers with an in-line transmission of at least 20% in this range. Enter your email address to subscribe to ZEROgeoengineering.com and receive notifications of new posts by email. How you can help: Your donation will help sponsor lab tests for folks who can’t afford the cost ($80). So far we have helped sponsor over 75 tests for people around the world. Your contribution will also cover the cost of educational materials, flyers and bumper stickers. We provide these materials for free to help get the message out and raise awareness to focus on solutions. With your support, we can keep going 4 ZERO GEOENGINEERING.